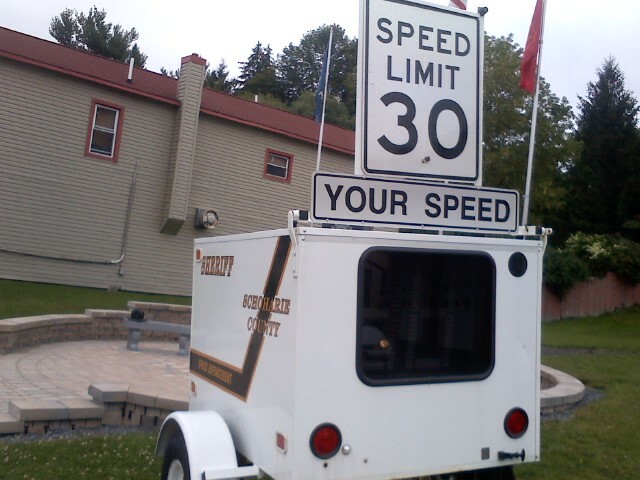 Home » election coverage , opinion » Opinion: Desmond's Idea of Speed Enforcement? Opinion: Desmond's Idea of Speed Enforcement? For one of them, incumbent Sheriff Tony Desmond, we already have an idea of what to expect in another term - and one in particular - turns me sour to his reelection bid. 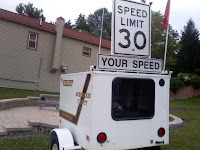 His department's "speed enforcement" mobile radar device, which I happened to see on a recent drive through the Village of Richmondville - placed in front of the fire house - is not only one of the stupidest police enforcement tools I have seen but a stark indicator of Desmond's view of effective road patrol. 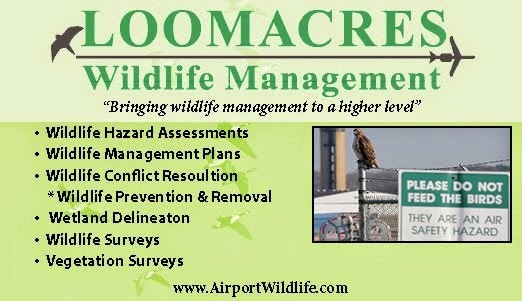 Sure, maybe I'm being unreasonable - after all, his campaign website pledges to seek two new road patrol officers in his new term, but as an old article from news 10 ABC reported last year: "The Schoharie County Sheriff's Department has increased their overtime budget for one month, allowing them to increase the frequency and area-coverage of patrols. This budget increase has been implemented in order to deter not only the slew of burglaries encircling the town's rebuilding efforts, but also to deter an increase they have seen in general crime," perhaps he should have sought two new deputies sooner. Between this and the department's hideous "mobile incident command" vehicle, it begs the question of what the budgetary needs and goals are at this point and time, and maybe it's just me, but effect road patrol doesn't seem to be one of them. 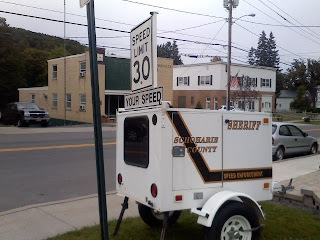 Unless one considers posting a giant radar gun in the various villages main squares to be an effective tool... I, for one, would like to grab bucket of balls and see how much my pop my fastball has these days, but I digress. So the Sheriff's department shouldn't use the tools it has? I'm sure someone would complain if it were sitting idle and they weren't using all tools available to keep us safe. As for 2 new deputies, the board of supervisors keep denying the need. I don't know why they hate the department so much, but it's not like Tony hasn't tried. The department can't get funding for ballistic vests, but let's donate to the animal shelter. Don't get me wrong, I'm an animal lover and agree the shelter is a great thing, but come on, there's something wrong with that. Budgetary needs? I think spending 41k to paint a few stairwells in the county building and discussing decorative trim should be more of your focus and why the public safety building still is torn down to bent metal studs surrounded by walls still oozing flood mud and debris. And the mobile command vehicle was the last administrations brain child, you can't put that on Tony.